I love everything about Ritter Sport chocolate. I love that it’s a family-owned business since 1912. I love the cheerful colors of the wrappings. I love the squareness of the bars. I love that there are so many unique flavors – Butter Biscuit, Yogurt, Milk Chocolate with Strawberry Creme – and regular Dark and Milk chocolate, too. Most of all, I seriously love the taste of this chocolate. It’s all incredibly good! I’m talking, “I want to try every variety ever made and will hunt for them across the globe”, obsessively good. Now I know what I was missing when I walked right by those funny-named, uniquely-squared, chocolate bars. 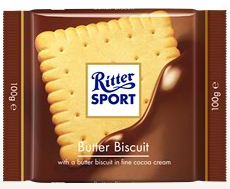 I think the name Ritter Sport threw me off; what did “sport” have to do with chocolate? Well, back in 1932, Mrs Ritter conjured up the idea that their chocolate bars should fit perfectly in a sport jacket, be the same weight as rectangular chocolate bars, and not break. Voila – the square Ritter Sport bar! The coolest and unexpected thing about these bars is the Snap Open Pack – totally unlike anything else I’ve ever seen in a chocolate bar. The quality of this chocolate blew my mind! Every flavor was fantastic! I don’t even like hazelnuts, but I actually happily ate some of the Whole Hazelnut Milk and Dark Chocolate bars. Even the nuts were perfect – whole, fresh, and plentiful. Ridiculously good. Dangerously good. WOW! My favorites are the Milk Chocolate with Strawberry Creme (to die for), Milk Chocolate with Butter Biscuit (a butter cookie hidden in chocolate? Brilliant! ), and the super smooth Alpine Milk Chocolate (this stuff’s going on my special occasion list for eternity). 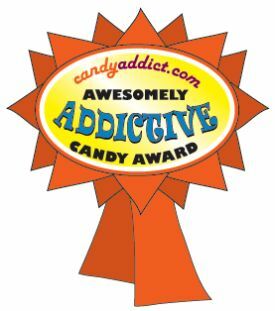 For a limited time, you can enter for a chance to get some free chocolate, too! Send a Halloween e-card to trick your friends and possibly win a treat from Ritter Sport! 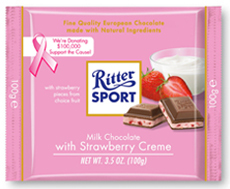 Each day from October 18 to November 6, 2010 a box of Ritter Sport Minis will be raffled off. Get entered in to win! The e-card are pretty cool, too! 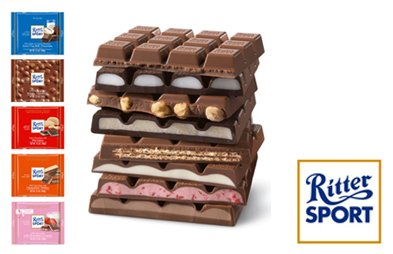 If you don’t win, I’m telling you… you REALLY want to try Ritter Sport! There’s a flavor for everyone! Ritter Sport is 100% Awesomely Addictive! Trick your Friends – enter a raffle to win! I, too, love the chocolate. Hazelnut is good, but the biscuit is just wonderful. This is some of the best chocolate I’ve had in recent years. I think you should mention that Ritter is a German company. It’s kind of cool. 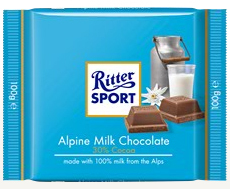 Sweet Jesus, I love Rittersport…usually purchase Marzipan in large quantities when available, regardless of price. I recently discovered the Knusperflakes bar and oh my gosh it’s AMAZING! 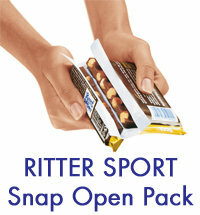 Rittersport is awesome!!! Cornflake is my favorite. Hey, I’m living just 7 miles from the Ritter Sport factory in Waldenbuch/Germany.